SAP's just-announced new business unit is aspiring to deliver simplicity, choice, and rapid ROI to small and mid-sized companies. On July 17, SAP announced the formation of a new business division called the SMB Solutions Group. Many details remain to be discovered, but this could potentially have a huge impact on mid-market ERP. 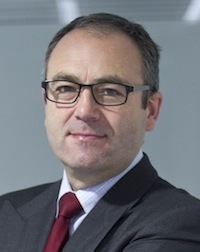 Tellingly, SAP appointed Dean Mansfield to lead the new division—Mansfield spent six years at NetSuite, where he was President of Worldwide Sales and Distribution. The new group serves SMB business, defined as those with under 500 employees. This is part of what SAP defines as SME; i.e. Small and Medium Enterprises with under 1,000 employees. SAP provided us with a diagram showing the existing SAP solutions for SMEs. I overlaid it with the burnt orange color text and lines to illustrate where the new SMB Group is focused, which is cloud solutions for SMBs; Small and Medium Businesses, with under 500 employees. In Figure 1 below, the left side of the vertical dotted line is “On Premise” solutions and the right side is “SaaS” or cloud solutions. 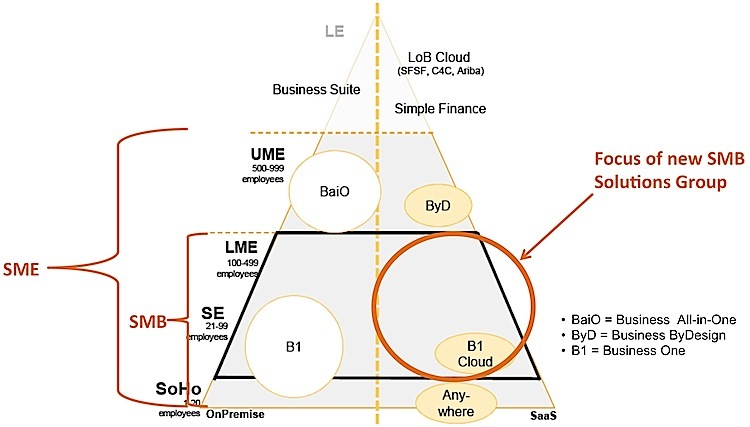 Along the left edge of the triangle, you can see SAP’s definitions of the market segments, defined according to the number of employees, going from smallest at the bottom to largest at the top. Mansfield said the SMB group will build “the next generation of solutions for Small and Medium Businesses … a new business operating system … comprised of SAP-created solutions and partner-created apps.” They are not planning on replacing the existing applications (e.g. B1), but rather will be building an alternative solution. It will be interesting to see how long that coexistence lasts. SAP executives clarified to say they wanted to give customers a choice between on premise and SaaS, so it is possible that the B1 cloud version may be phased out in favor of the new solution, while retaining the B1 on premise version. The timeframe for SAP creating this new solution is “over the next two to three years.” The first release is tentatively targeted to be announced next year at Sapphire and released in the second half of 2015.1 This will be a single code base, which SAP says will be architected in a way that makes it easy to enable slices of it, so that customers can easily select relatively granular modules. This means SAP’s customers can start with solving a specific business problem and then expand as needed from there. The solution will be cloud-based, likely multi-tenant, and based on HANA and HTML-5 technologies (among others). The product group leading the effort is based in California (not Germany) with much of the coding being done in Shanghai. Mansfield emphasized that the new group is about more than just technology. It will be wrapped in a “business management approach,” to help business migrate to these solutions. And it is about really trying to make the solution easy to consume. Like having much simpler license agreements and sales models. If SAP can deliver on this goal, it will be perhaps the most visible manifestation yet of their CEO, Bill McDermott’s recent declaration at SAPPHIRE, that “SAP has a bold vision for the future of business: a simpler world, simpler SAP and simpler customer experience.” That would be a major change for SAP. Competition for the small and mid-market for ERP systems has been heating up for years. There are literally millions of businesses that would love to migrate from paper or are growing too big for QuickBooks, and strive to gain the capabilities needed to compete with the large enterprises, but without the burden of a big IT staff and data center. As a result, NetSuite and others have seen robust growth. Epicor, Infor, Sage, Plex, SYSPRO and others each have their own unique differentiators to serve specific segments of the mid-market. If SAP can truly deliver the level of simplicity they aspire to and combine it with the depth of functionality they are famous for, they could prove to be an even more formidable competitor in the ongoing SMB market battle. Time will tell.